This minor update fixes some problems of the initial 1.0 release (or newer) and probably the last before the next major release. No graphical changes until the next major revision. - Updated Ares to stable version 0.2. - Replaced "Dark Pink" selectable color by "Tan", "Dark Lime" and "Olive". - Now messages color of each mission that isn't for Allies or Soviets will be green instead of blue. - Fixed random percentages for each side. Before almost always a RA2 was selected when player used "Random" option. - Increased attack intervals in Easy & Normal dificulty levels. Before all dificulty levels were "almost" identical. - Nod Repair Vehicle, Nod Cyborg Commando & GDI Mammoth Mk. II menace for the AI increased. - Decreased strength of the GDI Mammoth Mk. II from 1300 to 1100. - Decreased building time penalization for GDI Mammoth Mk. II from 50% to 25%. - Now can not be built Yuri & Soviet versions of the Clonning Vats at the same time. Yuri Clonning Vats, like the Soviet version, can not be deployed with the Soviet Industrial Plant at the same time. - In Nod mission 7: "Destroy the Research Facility" (TS campaign) Multi-Missile super weapon damage increased. - In Nod mission 9: "Protect the Waste Convoys" gas clouds damage (produced by the Chemical Missile super weapon) decreased 33% and gas clouds duration increased by 25%. - Now AI Nod Stealth Tanks will attack automatically air targets. Human players still have to target manually air units. - Re-done Naval War game mode. The few ground units that are still buildable will have an extra build time penalty of 300%. - Some minor skirmish AI bug fixes. - Updated AI of the single player campaigns with the most recent skirmish AI. - Restored multiplayer map: Tour Of Egypt (2-6). This minor update fixes some problems of the initial 1.0 release (or newer). No graphical changes until the next major revision. It is an acumulative update so you don't need install any 1.0.x release before this one. - Decreased Allied Mobile Gap Generator cost from 2500 to 2100 credits. - Now Nod Mutant Hijacker can't capture aircrafts that need an airpad. - Now Yuri Magnetron can hurt Nod Cyborg infantry when is promoted to elite. - Restored Soviet Industrial plant original vehicle cost reduction (25%). - Now the player has to choose between Soviet Industrial Plant or Soviet Cloning Vats. AI will build Industrial Plant by default. - Fixed selectable Dark Red color in skirmish/online. Update: ModDB ID has been changed from "cc-reloaded" to "cncreloaded" ( www.moddb.com/mods/cncreloaded ) because every service has the same cncreloaded name. This could break your links to that page, sorry for the inconvenience but is something that I had to do soon or later. Update 2: Updated link to v1.0.3 due to a small mistake (but unfortunately very visible) in a script that Allied AI will use frecuently. I released an update that fixes some problems of the initial 1.0 release. No graphical changes until the next major revision. - Skirmish AI improvements. If all goes well I'll backport the changes into the single player missions. - Fixed bug in Survivor game mode that forced players to play with only the main unit (the repairer vehicle). - Now Nod Cyborg is affected by Chaos gas. - Fixed a mistake in the Psychic Dominator cameo. - Mirage Tank detection percentage (per individual unit) increased from 15%,5%,2% (hard, normal, easy) to 25%,20%,15%. This percentage is applied only when the Mirage tank is firing. 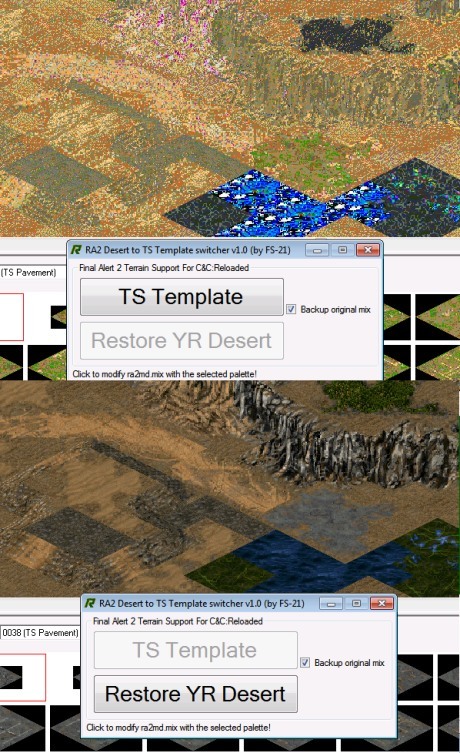 - C&C:R Mod manager upgraded to the version 3.6. I added some new screenshots in-game of the current state of the mod at modDB. 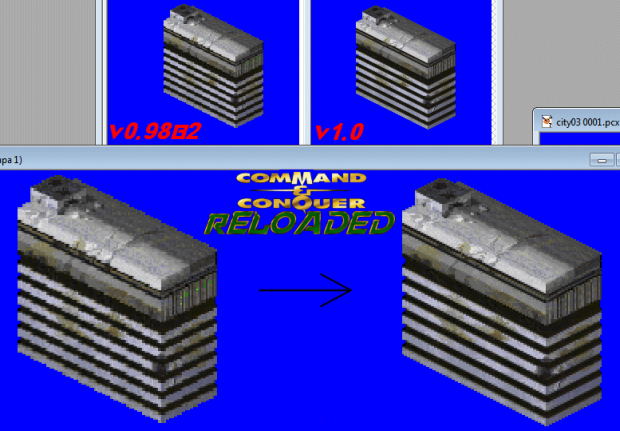 As I said previously I have been working fixing TS graphics & possible bugs I could find in YR/RA2/TS missions (Nod only in this release) for the v1.0 of C&C:Reloaded. In addition: If you want help me with the Mod Launcher testing I'm preparing for the 1.0 release I left a copy of the old v0.98 release of this mod packed with this program in this forum topic, feedback would be necessary to polish any possible bug I couldn't notice. Long time has passed since the last news I published in the website, until now all new updates were published on the C&C:R development forum, ModDB, Facebook & Google+. High bridges, TS terrain radar colours, civilian buildings... and for future releases I'll focus in TS terrain tilesets (cliffs, roads, etc). With those improvements in TS civilian buildings I could start implementing (in future releases) a RA2 feature: garrison into buildings. Another thing I have to decide before the release is what I'm going to do for the RA2 & TS videos for the RA2 & TS Nod single player campaigns... YR video campaigns aren't a problem but RA2 campaigns can't be used directly from the installed game :-/, well, soon I'll open a forum topic in the C&C:R development sub-forum for disscuss it. Anyway it would be an optional download so it would not delay the mod release. I hope the next time I'll publish news is for the 1.0 release announcement.